Live chat in trading platform, 3 risk-free trades, Swiss prepaid card, personal success manager, advanced platform with indicators and trade ideas. $50 minimum withdrawal threshold. Reach 100% turnover to withdraw without a bonus, 300% with one. $50 fee for bank transfers. For all other transfers without a bonus, 1% or $20, whichever is larger. With a bonus, 3.5% or $20, whichever is larger. If you try to withdraw before meeting the turnover, you pay an additional 20% fee. The vast majority of binary options websites are white label SpotOption brokers, meaning they all use the same platform and provide more or less the same product. But one which is quite distinctive is BinaryMate. BinaryMate has its own proprietary platform. The most unique feature on that platform is the opportunity to chat with an account manager at any time. In every case, the account manager is a beautiful woman — and you get to watch her live through the video feed while you are trading. Is this a gimmick? Technically yes, of course it is. Whether or not it has value is something you will have to decide for yourself. BinaryMate’s account managers appeal to the same crowd who enjoy gambling at live casinos online with beautiful dealers. If you play at live casinos, you probably will also like BinaryMate. How does BinaryMate hold up in regards to other features? It turns out to be a mix of very good and very bad. All three come with a demo account — which is great. The account page is pretty nifty in itself; there is a slider which you can drag to see the features and benefits based on your deposit amount. Two common account currencies are available: euro and US dollar. Traders may choose to keep accounts in one of the major cryptocurrencies. Deposit in your account via credit or debit card, bank transfer, QIWI OKPAY, Payoneer, Perfect Money, WebMoney, Neteller, Skrill, Bitcoin, Litecoin, and Ethereum. This site gives out massive bonuses — up to 100% on amounts as high as $50,000. The good news is that you can accept or reject a bonus as suits you. Many other websites require you to accept a bonus in order to trade, which can cause problems when it comes time to withdraw your money. You must meet a turnover requirement of 300%, or pay a 20% processing fee. If you do meet the turnover requirement, you will still pay a fee of 3.5% or $20, whichever is higher. This is true for all withdrawal methods except for bank transfers, which command a $50 fee. You must meet a turnover requirement of 100%, or pay a 20% processing fee. If you do meet the turnover requirement, you will still pay a fee of 1% or $20, whichever is higher. This is true for all withdrawal methods except for bank transfers, which command a $50 fee. There is no denying that those are some hefty fees! The only upshot here is that the 300% turnover requirement is only to 3x the amount of your deposit + the bonus, which is actually stupendously low compared to the average — which is closer to 30x. When you first click into the trading platform, you will notice that it is very different from most. The standout feature which will instantly grab your attention is of course the live video feed. There you can see your account manager. You can address her in the chat window underneath at any time while you are trading. You can trade on BinaryMate on your desktop or laptop. Another big drawback with BinaryMate is the lack of variety in trading. There is only a single trade type: High/Low. There are no features to control your trades (Early Close, etc.). You can trade currencies, commodities, stocks (no indices), and cryptocurrencies (Bitcoin, Ethereum, and Litecoin). Only 47 trading instruments are available. So what is there to get excited about here (aside from lovely account managers)? It turns out that this is actually quite an advanced platform. You can add a ton of different indicators to your charts to plan your trades, and you can expand the charts to fill your entire screen. If you click around, you will also discover another cool feature: suggested trades. 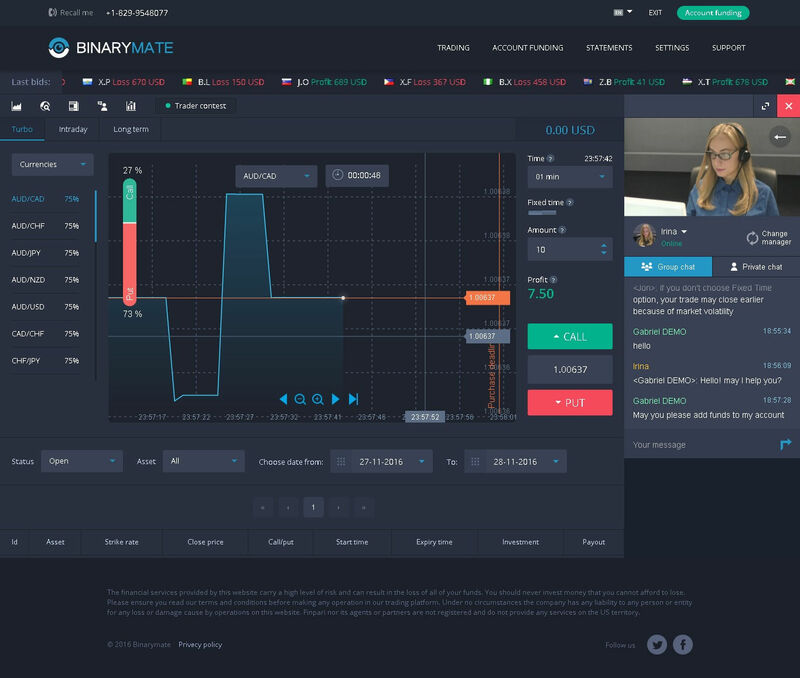 The team at BinaryMate regularly uploads trade ideas and posts them in the platform where you can view them, read the analysis, and decide whether to use them. This is provided entirely for free. It is not the same thing as a signal service (because you need to log in and view the data manually), but it is an excellent addition to the site (assuming of course the trades are effective). While I was checking out the demo platform, I had a few questions and asked them in the chat window. The account manager answered quickly in each case. How helpful was she? Well, she didn’t seem to entirely understand my questions – so no, these women are not expert traders. You should definitely not be relying on them for educational advice about trade decisions. But she did do her best to answer my questions, and in most cases managed to do so, however indirectly. There is also a telephone line you can call. You have the option to request a callback as well. The biggest drawback with BinaryMate appears to be their fees. That said, if you are planning to accept a bonus, BinaryMate actually has fewer strings attached than most sites. But you will pay a significant fee for every one of your withdrawals. Think about it. If you deposit $250, and you try to withdraw that amount, you will pay nearly 10% in fees. There are a lot of cool, unusual, and fun features on BinaryMate, however. If the video chat with the attractive account managers is something you enjoy, it can be a great feature. If you are a little more serious about your trading, you should find the trade ideas and the charting tools available in the proprietary platform quite helpful. So while BinaryMate has advantages and disadvantages, we can cautiously recommend it to those who do not mind the fees. Binarymate was working with me and very helpful until it came time to start withdrawing my winnings. They told me my funds would be sent to Bitcoin in one day but after 2 days it still wasnt there so I asked them about it they said it had been sent to my first credit card I used months ago but that card I had quit using its no good anymore and I had already told them to remove it but they sent my funds to it anyway. When I brought this up to them they refused to do anything about it and insist they have to send my withdrawals to that card which is crazy since I cant use it and had stopped using it months ago. They wont do NOTHING TO HELP THEIR CLIENTS GET THEIR EARNINGS SO DONT WASTE YOUR MONEY USING THEM! SCAM ALERT!!! I placed a 1 min call at the bottom of a large red candle and watched it close at the top of a large green candle only for it to say I lost. When I looked at the order I discovered it had given me a strike price well above the price action. I confronted them, showing them 4 different sources TOS, MT4, TC2000, and their own trading platform proving the price action never crossed the supposed strike mark. It was physically impossible for that strike to be correct. And I mean not even close. All they said was our records show bla bla bla. So after a back and forth I asked for their regulatory body was and surprise surprise they don’t have one. They will rip you off and there’s nothing you can do about it.